This view of Ruthton Point was originally owned by Emory Davenport. If you follow the flume you can see a bit of the mill. The Morton farm is in the foreground, anf the cluster of houses is just uphill from the mill. I can't see the railroad tracks, but we know they run right past the mill. It is dated circa 1900. This flume came from Greenpoint, to Frankton and then down to Ruthton, correct? So much labor put into building this business and 120 years later, very little evidence remains. Photo #877 is good for comparison. Like to see a present day shot of this, anyone have the right connections? This picture reminds me that I have been wondering about several roads that existed pre-I84. How did one get to Ruthton Point, Koberg Beach and we frequently went to the "mole." Without the 3rd St. overpass was there a road by the train station that continued on out to the "mole" and Nichol's Basin.? Having returned after 50 years away, memories are fading! I just read the other day, somewhere, that Ruthton Pt. was quite isolated. Access up to Frankton was not easy. I don't believe the flume was as far east as Frankton. The map I have shows it west of Country Club Road basically following the Phelps Creek drainage. Concerning how you got to the waterfront before the 2nd Street overpass- the road took you down to the tracks, and you crossed the tracks to get to the water. The overpass construction brought in a large amount of fill but there used to be a natural grade to get down to the tracks. 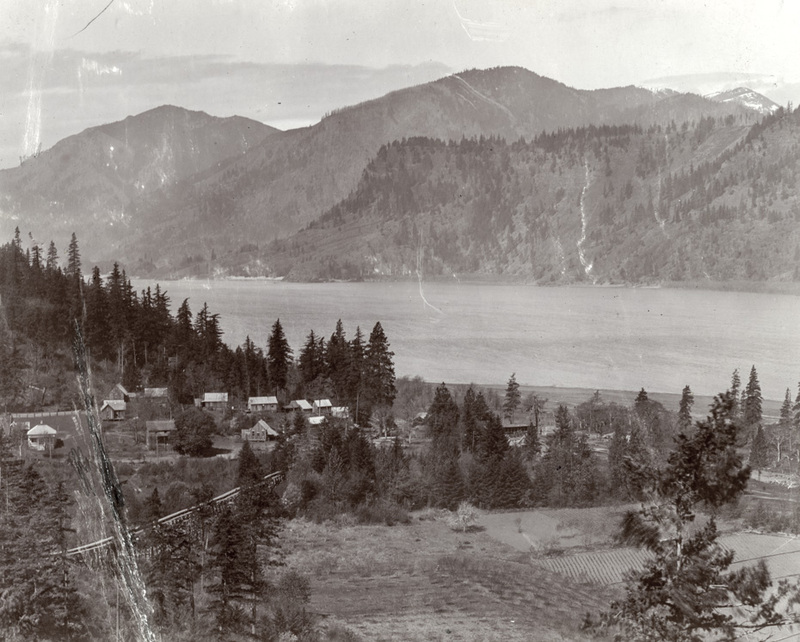 My first memories of going to Kobergs was driving up the old Columbia River highway (US30) and parking near where the distillery dumped their pears (Oh the smell) and climbing down over the hill. You had to climb over the railroad tracks to get there. At one time some of that land down there was owned by Rev. George William Kennady. He was of our Wells family. He arrived in Oregon from Pike County, Illinois with his family via ox wagon. His parents were William Morris Kenady and Mary Ann Wells. The name was oginally spelled Kenady and why he changed it to Kennady I do now know. He died in 1926 and is buried in Idlewilde. Also it was down in that area along the river that Chief Chenowith had his village. It was either just down friver out of this photo or up river a tad. Would have to see more land area to know exactly where it was. Koburg could be accessed along the river at low water. A high water route can still be followed down from the trail parking lot at the east highway 30 gate. Thanks Norma...I have "fond" memories of that road fruit storage area, 22 rifles, rats and a certain cousin of yours with a shotgun. just added some taste to the vodka.